The vacuum left in presenting on things technology now that Steve Jobs has gone. Can All Things Digital’s Kara Swisher fill the gap? Um, er, No. My preparations for Macworld 2012 are well and truly underway with flights booked, special guests invited, prizes being organised for attendees and reviewing my syllabus. One of the things I’ve been doing in Presentation Magic workshops in 2011 is showing presentations by others and asking attendees to offer up a critical analysis of what they’re witnessing, based on the presentation principles so far addressed. One of the primary sources for high quality presentations across a variety of styles and subjects has been the official TED website. Here, we’ve seen an increasing professionalism in the quality of both slides and presentation. Even Bill Gates has shown vast improvement. Less so, but no less instructive, is the TEDx satellite circuit, where organisers can license the TED brand according to some very strict rules. Here, the quality control is much more varied, and occasionally one gets the feeling favours are offered to speakers by organisers. That was certainly my experience at the TEDx I attended in Canberra a few years back where I scratched my head at the inclusion of one or two speakers. Their presentations were poor, and seemed not to fit the theme of the day. Moreover, the organisers had not thought to offer a vanity or confidence monitor for speakers, who continually turned their backs to the audience to view the screen behind them, some reading off their displayed slides. My tweets were very critical of the presentation style of some presenters. This week, while on the lookout for more presentations to showcase at Macworld, I located the TedX BayArea Global Women Entrepreneurs event. I was actually doing my usual search for all things Apple, when I located a talk at the event which mentioned Apple, by well known tech journalist, Kara Swisher. I was aware of Kara’s work from her interviews with Steve Jobs, as well as her authoring a book quite a few years ago on the rise and fall of AOL, in which Apple had played a small part (if you recall eWorld). I recalled that Kara had been indisposed for the All Things Digital event in Hong Kong recently where she had planned to share the stage with co-host Walt Mossberg. And I was aware she’d suffered a stroke. Her speech description intrigued me so I was prepared to sit back and watch her for the standard 18 minute Tedx Talk. Here is the speech below, from the YouTube site. Watch all of it before you come back, or just the first five minutes and make a mental note of your emotional response to what you witness. For me, there were several things that felt like the proverbial fingernails down the blackboard sensation. 1. Did she start her speech by dissing her host for mispronouncing her name? Did this set the tone for a rather snarky speech that followed? There seems to be no one safe from her sarcasm: United Airlines, Microsoft, Rupert Murdoch (her employer) to name a few. 2. Kara was placed between two screens showing her slides and spend about 80% of her time looking at the screens, and not at the audience. Even when the slides were no longer relevant to the story she was telling. 3. Within fourteen seconds, the thing that most got in the way of her presentation made its presence felt: “Um”. There were other connectors too, such as “Er” and “you know” but these did not grate on me nearly as much as the incessant river of “Ums”. Now these might go right under your attention radar because the content of the speech is riveting and engaging for you. But for me nowadays, I attend to both process and content. Not just what is being said, but how are the ideas being conveyed? In Kara’s case, I appreciated her attempts at sarcasm and the occasional self-depracating dig and had a laugh too. But there is a quantum of hubris in this speech which is unattractive and disengaging, not helped by the torrent of Ums. 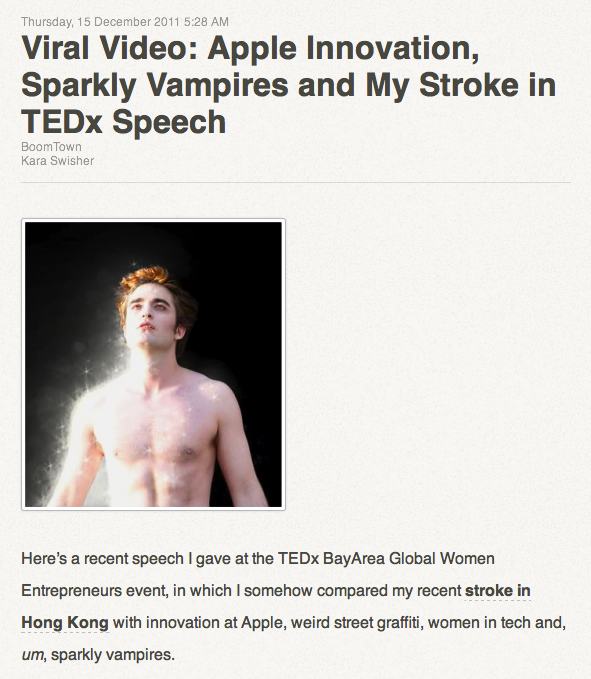 “…women in tech, and, um, sparkly vampires.” (see screenshot, above). So I decided to see what her talk would be like without the “ums” included, but leaving in other connectors and pauses. I imported the video downloaded from Firefox into iMovie and edited out all the ums. In a moment I’ll reveal how many there were in her 20″ speech. You can see the results below, and do note that the video does jump about a little, so if this bothers you, just look away and listen, and ask if her speech flows better without the ums. But the fun discovery was what I did with the edited elements. Sometime ago, I had work led on a Keynote project where we had to include a sound file of an interview. It was recorded in Garageband, and it was in there that I edited out long pauses, “you knows”, “ums” and long breaths to give the podcast some polish. It sounded so much better and professional, smooth and flowing. So in Kara’s case, I look all the out taken “ums” and put them together in chronological order. The resultant movie file is below, and I’ve topped and tailed it with the intro and finish elements. What’s astounding is both the number of “ums” and how much time they take up out of an 18″ speech (actually it was more like 20″). So, how many “ums” were there? Watch the video below, and I’ll give you the number below it. If you can be bothered counting, there are about 96 Ums which fully take up a minute of her allotted time. That’s 6% of her total speech in connectors. There are many ways to think about these utterances. Rarely do they add to the comprehensibility of the speech. For a few of them, they are cues for the audience to laugh: “Hey, I’ve said something funny – this is where you laugh.” It allows the audience to take a moment to digest what’s just been said before Kara moves on. Stage actors in rehearsal without an audience need to know from the director sometimes when to pause when the audience is expected to laugh, otherwise the next funny line goes unheard. 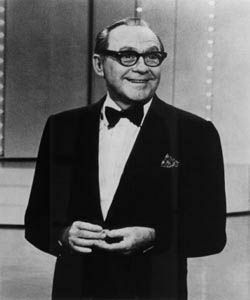 Jack Benny would merely pause and look at the audience for it to be their cue to laugh. Other shows of course employ a laugh track to goad us into enjoying the performances. And many other comedians have found their own way, from the raising of an eyebrow, or the curve of a lip, to let you know it’s OK to laugh at this point. However, in Kara’s case there are less than a handful of these. Most of the ums are signatures of other less redeeming aspects of a presentation. To my eyes and ears, these other ums and other connectors like “er” and “you know” are signs of under-preparedness, too little rehearsal, anxiety, and attempts to wing it, possibly in the belief that the spontaneous retelling of her story will suffice. Let me be straight with you. I don’t rehearse all eight hours of my Presentation Magic workshops. I do rehearse each of the slides and how best to use it to tell my story. I don’t write the lines out, nor add them to my slides in Keynote’s presentation mode. Rather, every so often I’ll use the Post-It note style comment icon to remind me of the movie that’s coming next, or a factoid that I’ve forgotten on a previous occasion. But I don’t memorise every word. I simply rehearse – lots. In a TED talk however, you’ve only got 18″ minutes to make your story count, no matter how famous you are. You need to be rehearsed and unless you’ve really got vast experience winging it, like a stage comedian dealing with hecklers, you’re better not hoping for the best on the day. Kara’s “um’s”, snarkiness and her leaving her essential message right to the very end – it’s OK to work to your own schedule even if you’re ill – requires her to use Steve Jobs to provide ultimate evidence of her belief. He arguably produced his most influential and lasting creations while fighting cancer, so anything’s possible if you apply yourself. I tweeted Kara to say I had watched her speech but her “ums” needed some work, to which she replied shortly afterwards, “forest, trees”. Our next tweets ended up with her reinforcing her point I simply didn’t understand her speech, and ultimately would never “get it”. Kara’s a very influential person in the tech world, an employee of Rupert Murdoch’s, but ultimately when you get up on stage in front of a live audience and another one which may number in the thousands who’ll watch you for years to come on YouTube, you owe it to your audience to be rehearsed and prepared, especially if you want your story to be persuasive. I include modifying your idiosyncratic speaking style to minimise your off-putting connectors. It’s something I continue to work on for myself. By the way, I did give some thought that perhaps her anxiety or frequency of “ums” was a possible aftermath of her stroke, but locating other speeches she’d given before the stroke suggest this is Kara’s usual speaking style. Your thoughts? Am I making too big a deal out of this, or did I miss something that is important to you? UPDATE: Two predictable responses on Twitter and on a blog. @karaswisher asks on Twitter if I have nothing better to do (presuming she’s read the blog) and the simple answer is we’re on holidays here in Australia, so things are slow, and I am putting together my Macworld syllabus and Kara’s presentation is a possible inclusion. Many people do want to know how to control their speech style even in workshops on Keynote. It’s value adding. Over on his personal blog, Jose de Silva essentially agrees with Kara that I’ve mistaken the forest for the trees and have lost sight of locating a presenter’s content. My counter-argument (which I would have written on his blog if comments were allowed) has always been that audiences should not be made to work so hard to decipher the message. That you can assist the transfer of learning process by making it easier through an understanding of adult models of learning (see the work of Richard Mayer for examples), stagecraft, design and rehearsal. Make an audience work too hard and no matter who you are or your subject, they will disengage and reach for their iPhones to play Angry Birds. I agree with Jose about Kara’s being a superb journalist with a little snark, and perhaps not having time to better prepare her speech. Is this a sufficient explanation? No, it’s not. One can do both. (Or, to parallel Apple, don’t ship a product until it’s ready and capable). We can all do with a little help with our presentations, and I have only just missed out seeing Edward Tufte in New York January 23 because I booked my flights to Macworld too swiftly without checking Tufte’s 2012 schedule. My learning plan for this year is to see him and Stephen Few and really upskill my data visualisation prowess. This is especially as I’ll be targeting scientists and educators this year with my Presentation Magic workshops and blog. Finally, if you look around the various presentation blogs, I’m one of the few who puts up his unedited workshop evaluations in all their “glory”, not just positive testimonials. You gotta take it if you’re gonna dish it! Happy Holidays, Joe and Kara! UPDATE: It may have something to do with this blog entry, but Kara has now blocked me from following her Twitter feed. Quelle domage.